It's the beginning of the century, I'm this 13-year-old kid with my own virtual chat server on a program called The Palace. Middle school is a really hard time for a kid. My escape was in connecting with others on these online chats. 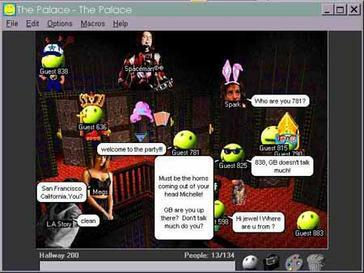 On The Palace, you would create avatars that move throughout chat rooms. This was very high tech for the beginning of the 2000s. My favorite part about The Palace was the script writing; you could write your own scripts for rooms IF you had a Palace server. A screenshot of “The Palace” chat from their site. I remember begging my grandmother to call some random person in California so that I could get a host for my own chat. Luckily she did. It probably was not the greatest idea in the world for a 13-year-old but it's one that changed my life. I wanted my chat to be the coolest. I chose a corny name for my Palace, I called it “Tinseltown.” I honestly didn't even know what it meant, I just thought “Hollywood sounds cool but I can't name it that.” The second step was to start writing scripts and to create backgrounds for my Palace. I had no idea what I was doing and I didn't care. I just knew I wanted it and no one was stopping me. I started writing room scripts, like one where you could go to rooms and click on a button to change your avatar. However, no Palace was complete without a cool custom 3D background. I found out other Palaces used a software called Bryce to create 3D backgrounds. I taught myself how to use Bryce and I created an infinite amount of 3D sunset background images, dolphins and palm trees included. 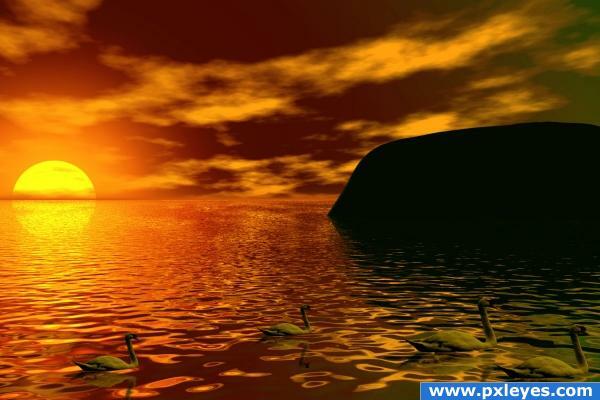 An example of a background created in Bryce and Photoshop. I loved computers and making things on them. It was my whole world. I excelled in my computer classes all throughout middle school. I was determined to take computer science classes in high school. I remember sitting down with my mother and a staff member to pick out classes for high school. I couldn't wait to discuss signing up for the computer science classes. The staff member explained to my mother that I hadn't taken the necessary math pre-requisites for computer science and that girls would not be comfortable in a class like this because it's a class dominated by men. I wouldn't take a computer science class until college and again, I was met with the exact same sentiment. I'm a woman and I don't “fit in” here. I look back and I have so many regrets. I didn't stand up for myself and I followed the path of least resistance. As I entered into the corporate world, I've been met time and time again with the same stories from women, especially women my age. Women who I know would have done amazingly in this space, they would have made a difference. They still can. Even if it's later, it's never too late. We need to support one another. Regardless of age or background, you can do it. There are a few things we can do to help support each other. I've created this list based on my experiences and interactions with women in tech and at conferences. I hope you'll pass this list along and add to it in order to reignite the passion for tech many women have and to keep the flame going for those currently on the journey. As a manager, you should already be inquiring about your direct report's career path interests but it's also important to bring up areas that might be overlooked. I know a few years ago, I would never even bring up an interest in tech just because I thought it was impossible. Sometimes you have to dig a little deeper and ask the right questions in order to get the real deal. Some of the best managers that I have had, have asked what they can do for me to reach my career goals. Sometimes you need to let them know it's alright to learn. Give them the permission to learn for 15-30 minutes a day. It seems like a no brainer but saying it out loud matters. If you're a manager, then you are most likely working with many areas of the business to identify needs across the business and create goals for your team that align with the businesses goals. If you know of a tech project that is occurring on another team, see if the manager of the project would be open to having some help from an employee on your team (if the employee is also interested). Make sure it is clear what the employee will be learning and contributing so that it is worth everyone's time. Leadership doesn't know what they don't know. If you have employees who are going the extra mile to learn new skills to help support their career and the businesses goals, then leadership should know. I'm not saying you should advocate for people staying late or working after hours but it is important to note their contributions. Make your company and team a space where sharing your successes and (even failures) is celebrated. At your team meeting or through some other communication, you can ask employees to share one success and one failure on any projects they are working on (even those outside of work.) Oftentimes when we see people in tech we only see their successes but that's after many failures. We need to make failure less of a taboo thing and instead show that everyone fails before succeeding. Then ask how the team can help their teammate to overcome the failure. There are many ways a manager can help to promote someone who is trying to learn new tech or programming. Ask them if they are interested in attending any conferences or events in the space and help to procure a budget for them. Then ask them to share what they learned. Give them permission to learn throughout the day with some free or cheap resources like Codecademy, LinkedIn Learning, Code School, or Treehouse. Ask them if they need help finding a mentor in the space or share your company's mentorship program with them. I'm a huge advocate of sharing the work our team does and when someone in the company shares my work it means the world to me. It makes me want to keep doing what I am doing. Give them a voice during meetings, on email announcements, or anywhere successes are shared! Thanks to people like Mark Oehlert for being an advocate of my work at work. I think it's also important to celebrate those who celebrate others. Our team is really good at sharing relevant events with each other. When someone from our team stumbles upon a great tech event they will share it with everyone on the team. I've gone to several events with teammates. It's uplifting and makes you feel like you are not alone. When I get home from work there's still a lot to be done around the house. The dishwasher needs unloaded or the apartment in general needs tidying up. My boyfriend knows how much I care about my career and learning new things. He's so great at telling me, “No, go sit down and do your thing.” If you give someone a little more time to learn it will make a difference. So, help out with the kids, the dog, the whatever, and give them some time to learn. Try to give them the time every week to learn. Sometimes the best way to learn is to explain to someone else what you're working on and it's also uplifting when someone is truly interested in what you're up to. It gives you a reason to keep going. Ask them what they are working on and to explain it to you. Wow, okay, so I did not plan on writing that much! I planned on adding ideas on how to start to transition into the tech field but I'll leave that for another time.